Available on the App Store for iOS, watchOS, & tvOS, and Google Play for Android. 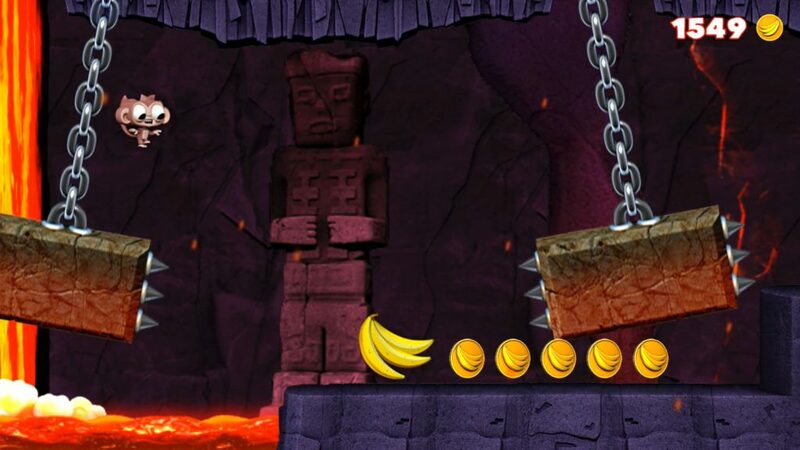 Dare the Monkey is an extremely addictive, super casual, one-touch platformer that evokes the spirit of classic arcade and console games. It’s a love letter to the golden age of Sega and Nintendo games but expertly reinvented for mobile. Think Donkey Kong Country meets Mr. Jump with a touch of Sonic the Hedgehog thrown in for good measure. Natural disaster has struck Dare’s beloved jungle habitat. To save his tribe, our little monkey hero dashes off on an adventure to find the twelve hidden statues of Jambo – his monkey god. Only when enough gold has been collected and offered at each location will peace and harmony be restored. 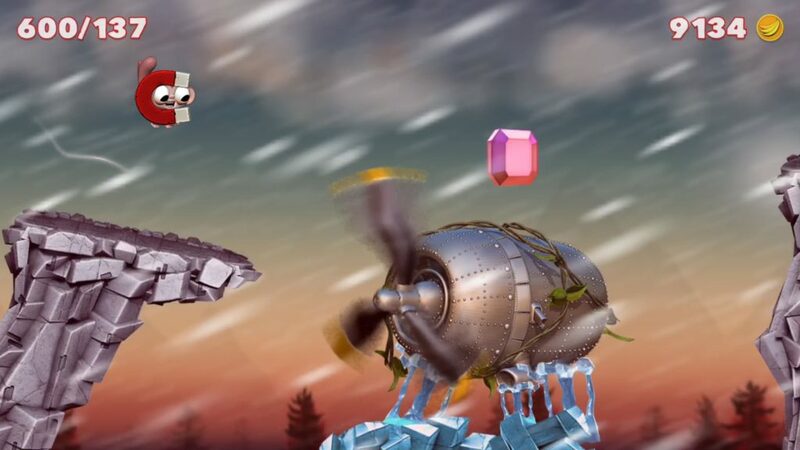 Three years ago indie developer Alan Caleb embarked on a journey to create a super casual, one-touch, platformer that would evoke the spirit of classic arcade and console games. The end result is Dare the Monkey – a love letter to the golden age of Sega and Nintendo games but expertly reinvented for mobile. Think Donkey Kong meets Mr. Jump with a touch of Sonic the Hedgehog thrown in for good measure. Aesthetically it takes you to a happy place. Dare – the game’s little monkey hero inhabits a world of azure blue skies, blinding suns, and pools of iridescent water. Visually it’s how you remember classic coin-ops looking. There’s a sense that every pixel has its place as you run, jump, and roll your way through each of the game’s gorgeous environments. It’s not just the visuals that are influenced by eighties and nineties video games. 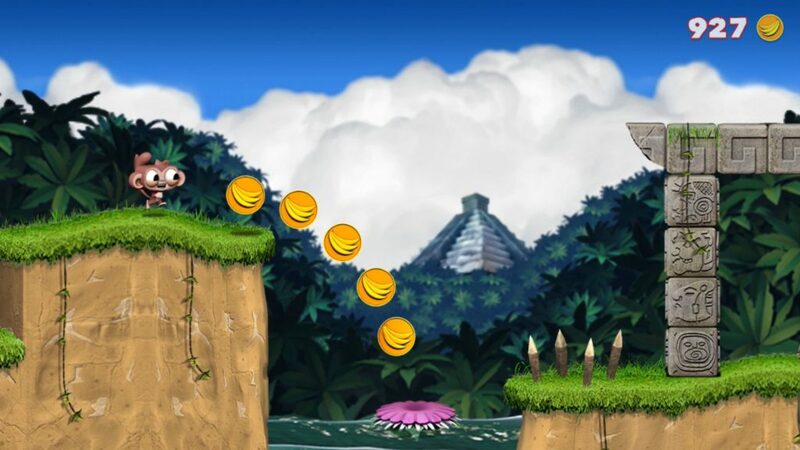 Dare the Monkey’s super addictive gameplay borrows heavily from that era too. 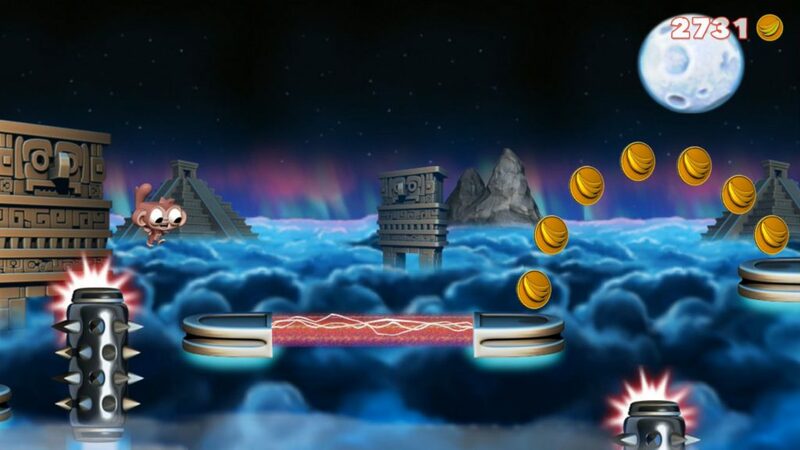 Levels are constructed around short, simple compulsive loops that keep players coming back. And that simplicity has been carried into the game’s controls too. Accessibility is at the heart of its design. Anyone can learn to play: a few taps of the screen and you’ve grasped the basics. Like many great arcade games, Dare’s easy to play but difficult to master. “That was intentional” says Alan. There’s a delight in its replayability. A rhythm to proceedings. A certain feel that lets you know you’re getting better. “You’ll begin by collecting coins just for the hell of it.” he continues, “but before long you’ll be chasing down every last one as you strive for excellence.” It’s these little things that combine to make something that’s hard to put down. It’s easy to think that Dare has been developed exclusively for an older audience who’re after that heartfelt nostalgia of their youth. However that couldn’t be further from the truth. But it’s not all about big. There was one more platform Alan was eager to target. “The fact that Dare focusses on a few simple core mechanics makes it perfect for the Apple Watch.” he explains. It’s another nod to his youth where he fondly remembers playing LCD watch games in class, hoping not to get caught by his teacher. “It’s the first endless runner to appear on Apple Watch” he says with some pride. “and perfect for short gaming fixes when you’ve got a few minutes to spare”. Whether it’s a slice of nostalgia you’re after or simply a challenge, there’s something there for everyone. Dare the Monkey bridges the sensibilities of classic coin-ops with the look and feel of a modern high-definition game. For Alan it was more than just wanting to provide something that was fun to play. It was about providing an experience. Dare the Monkey is available on the App Store for iOS, watchOS, & tvOS, and Google Play for Android. HRN Games is a new UK based video game publisher with a focus on the mobile games market. It was founded by Dave Goodger of Hot Right Now LTD – a mobile ringtone publisher. Dare the Monkey is HRN Games’ debut release. Team Dare is a two-person indie game studio founded by twin brothers Alan and Christopher Caleb. Dare the Monkey is their first game, which was development in sunny Scotland over a three year period.